Committed Thoughts: About that Q? I have no Q! About that Q? I have no Q! 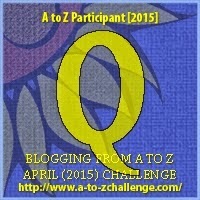 This is a quick entry to tell you that I just may qualify for the “prize” of finishing this A-Z Challenge. If you are a semi-regular reader, you know that I don’t always finish what I start, be it books or challenges…or diets…or…whatever, which can sometimes put me in a quandary. I hope that you find some quality reading in my (hopefully) quaint little piece of cyberspace, and that you don’t have any qualms about returning to read another post. I know I’m not the queen of bloggers, but I try not to be quarrelsome in my quest to write, and I try not to quibble, though I give in to my human side and do get quite testy every now and then and say things I shouldn’t. If I wrote just a quarter of the time I spent daydreaming, I could have written a quotient of books by now! I’m quizzical whether “quotient” is grammatically correct in that sentence, but I’m leaving it there. Perhaps I will query google later to quell my question on whether or not that is right; so don’t quote me on that just yet. 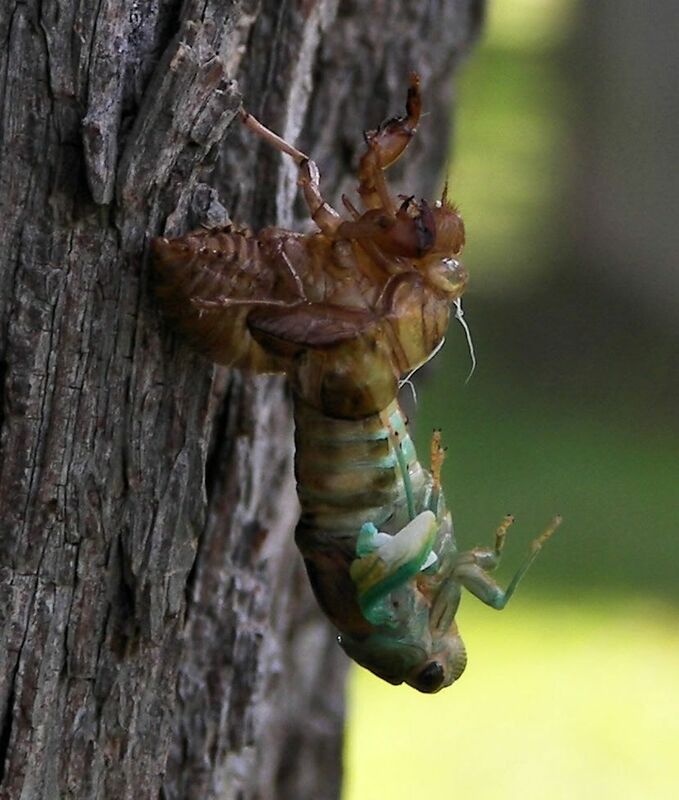 The Cicada has nothing to do with a Q.
he (or she) was in the process of molting. The adult is approximately .80 – 1.97 inches in length, but it's wing span is much longer, sometimes over six inches! 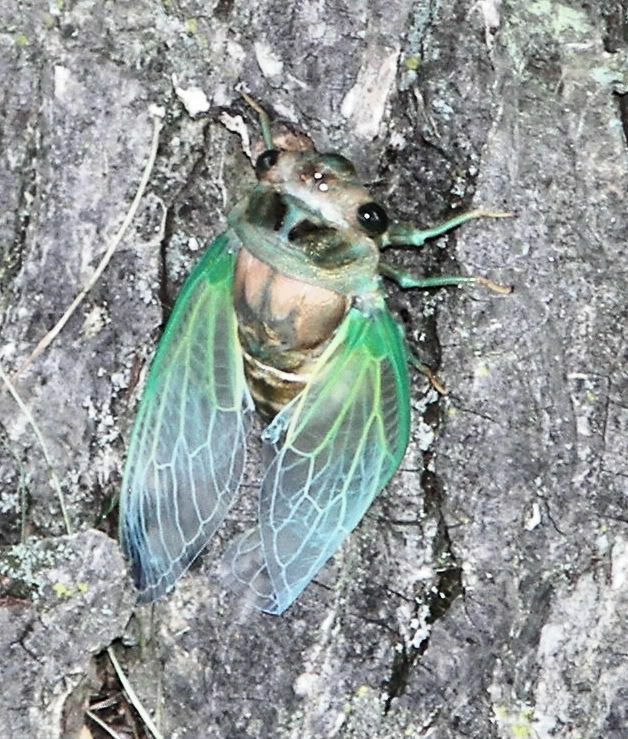 Cicadas have huge eyes of their heads, and three small eyes (ocelli) on the top of their heads between the two large eyes that match the color of the large eyes. 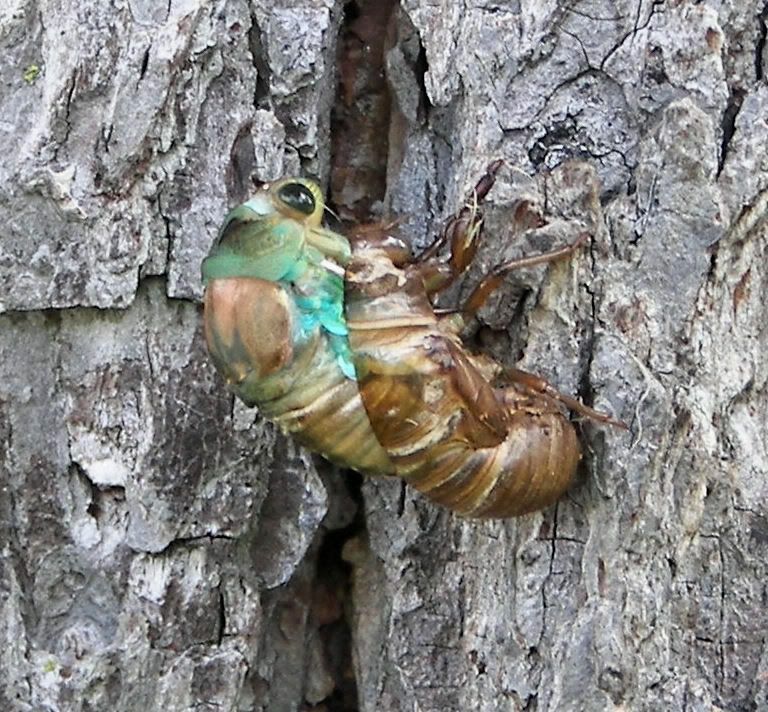 Cicadas live underground as nymphs for most of their lives, at depths ranging from about a foot down to eight feet down. Nymphs feed on xylem sap from roots and have strong front legs for digging. In the final nymphal stage, they construct an exit tunnel to the surface and emerge. They then molt (shed their skins) on a nearby plant for the last time and emerge as adults. The exuvia, or abandoned exoskeleton, remains, still clinging to the bark of trees. 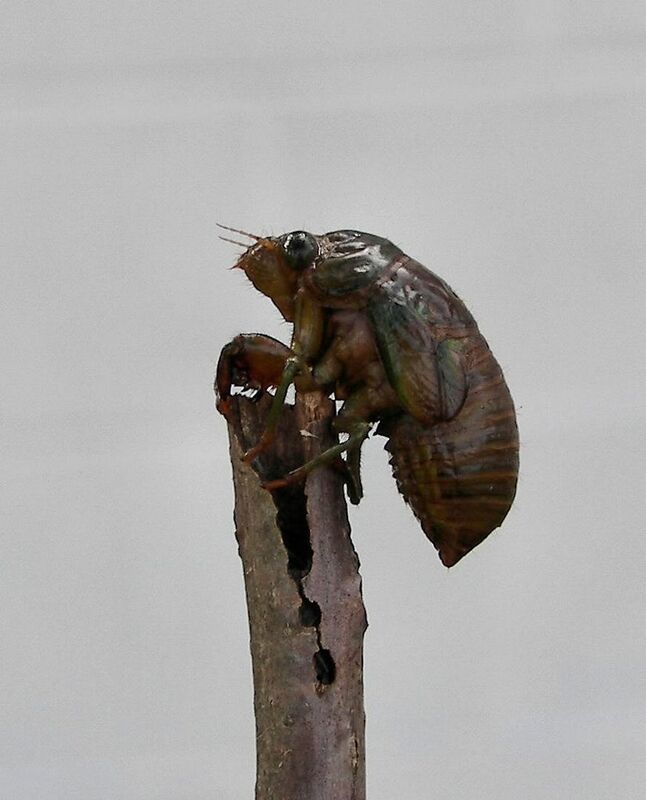 The cicada is harmless to humans, but will sometimes mistake an arm or a leg for a source of food and the bite as they try to taste you may hurt a bit. Hey. I discovered that if I click on your blog title on my blog roll, the post is there, but was not listed on my reader. Then if I click on "all blogs" your post comes up as having been posted x seconds ago. I've done it three days in a row. No post on my reader, click on blog title * there it is, close and click on "all blogs" and the post is published. Also quirky. 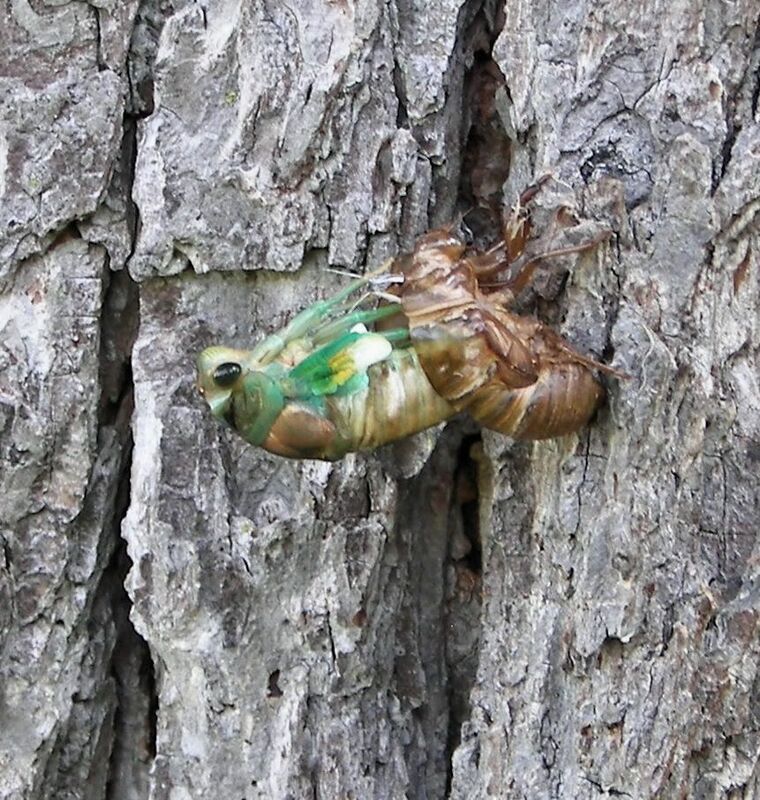 I don't think I've ever seen a photo of the adult cicada with wings before. They are actually kinda pretty. The color is rather pretty, especially when they first shed their shell. Noisy, but interesting. Your Q's and your cicada are delightful. What an amazing act to witness. I used to collect the shells. I have no idea why before you ask. I guess I liked the way they look. That's pretty interesting about cicadas ... but being a confirmed whuss, I doubt I'd have stuck around long enough to observe the process. It did take a while! About two hours, best I remember.